Are you sure it's not? I just checked and it's basically just recoloured Gary as far as I can tell. We'll probably be using any one of the sprites past post 25 of this thread. The current one is far too small and a little boring and bizarrely styled. Sorry, I do mind a canon head. Just observe the canon ones and try to make one on your own. Take the leap! It'll make you so much better of a spriter if you start pushing your limits. Using all three primary colours together doesn't work design-wise, I'm sorry. What I'm posting here uses the sprite frame of the hero from HG/SS, but let me know if it's not redone well enough or if I should make a new frame. I used Cranky's last post as a reference. We're using 3rd gen overworlds, so I'm not sure if that is the right size. I think that 4th gen overworld sprites are too big. I just checked the hero of R/S/E. 21x14, my little design is 19x14. Since the whitespace is vertical, it shouldn't matter. Seems fine to me then. We'll need the entire set though. I'm happy to finish the set. I wanted to do one angle first and just gather feedback before I finished the set. edit: I'm having problems with the side-view. Mainly because I don't know what to do with the hat, shading wise. All I've got for reference is the large hero facing the front, so I could use some guidance. Last edited by Triumph; 12-08-11 at 02:14 AM. Well, I'd say just keep the shading angle uniform, regardless of which way the character is facing. The in-game light source is constant, right? I suppose you're right. Here's a go at the 4 directions, standing position. Double post, but oh well. Looks like I messed up. 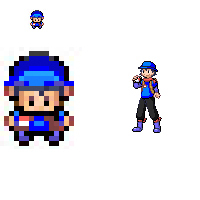 The version of the HGSS sprites I grabbed had been shrunk, and it wasn't a full set. Otherwise, I would've kept going. I'm having trouble finding a full set of the RSE hero though. If I had that, it'd be quite easy to start over and use the RSE set as a reference. edit: Found the set. Working on it now. I really like this! I think the hat's shading could use some work, though. Thanks Cyndadile. I agree, the frontfacing hat especially needs a shading fix. I'll work on it. Right now I'm working on completing the set. Just wondering if the *entire* set is needed for the demo (bike, fishing, etc). Running is necessary, though biking and fishing shouldn't be. Hopping off of ledges will happen too. Ok, that's easy enough. Though I'm not sure whether the hopping sprite is in the set that I have. I could attempt to recreate it if it's not there. Not if you make the shadow a separate sprite for that particular action, or don't make the shadow that far beneath the character sprite. I could do that as well. I guess I'm just unaware of the limitations of the game engine. I'm bad at judging small art, so I can't say much. It's a bit blurry for me, but it seems to be fine. I guess I'll add that version of the hat to all the sprites in the set once I get the go ahead from IB or other managerial staff. From the front sprite, the brim of the hat should extend past the ears. Currently the hat seems a little too thin. Could you fix that first? Last edited by ImmunityBow; 12-09-11 at 05:27 PM. Should be relatively easy to fix. I am kind of running out of room though, there are only 2px between where the hat is now and the tops of the eyes. Last edited by Triumph; 12-09-11 at 02:37 AM. The front of the hat is fine it just seems that the brim should extend over the left and right side as well. I think you have it, but like I said, I don't have the critical eye needed to critique sprites. Try widening the hat by another pixel on either side? Once again. Since I already made it, I guessed I should just put it up here, even if we aren't going to use it. First ever attempt at an overworld sprite, what do you think? Edit: On reflection he looked a little fat, changed the colour of the jacket to more yellow also. Last edited by Will; 01-06-12 at 11:41 PM. Not bad, I don't think his hair is a straight cut across the forehead though? Pretty decent, good job. Could you make a frame for each direction? To the left is my sprite, in themiddle is the character it is based off of, and to the right are the people I stole parts from. The hair doesn't quite match up. The overworld's is swept to the side and looks a little long. On that sheet, upper right, there's a karate guy. Would that be a good base for the hair? That looks a lot closer.